The glorious, warm and sunny weather on the West Coast has prompted a desire for simple and lighter fare these past few weeks. With heat on the rise and a long, dry summer ahead, I am trying my hand at tasty tongue teasers that don’t require the use of an oven…or better yet, need no cooking at all! A plate of scrumptious plant-based food also lessens the digestive load, making for an all-around pleasant gastro experience. 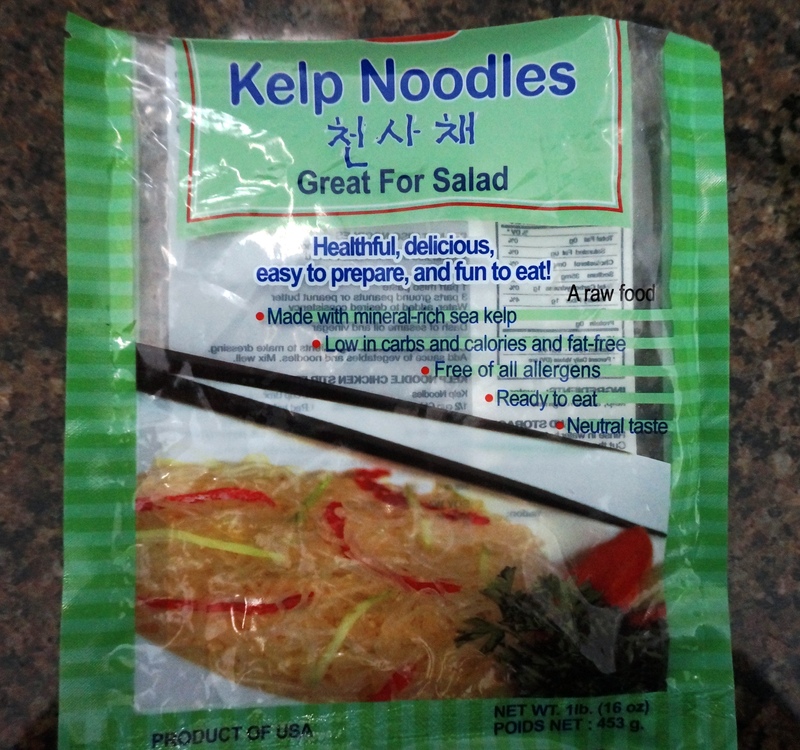 So, cool no-cooking in mind, while at the natural foods market the other day, a bag of raw kelp noodles all but jumped into my grocery basket. What?! Yes, these springy, bland-tasting noodles are made from kelp – a brown seaweed that grows in the ocean. Neutral in flavour, they provide a wonderful stringy canvas to absorb the essence that you, as the chef-artiste, will impart. They are awaiting your kitchen flare! 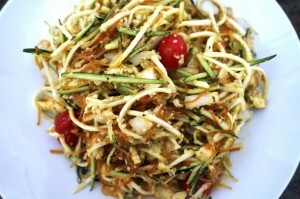 Quick nutritional backdrop: look for raw kelp noodles, which essentially have no fat, protein or sugar, and are low carb, low sodium, and low calorie. 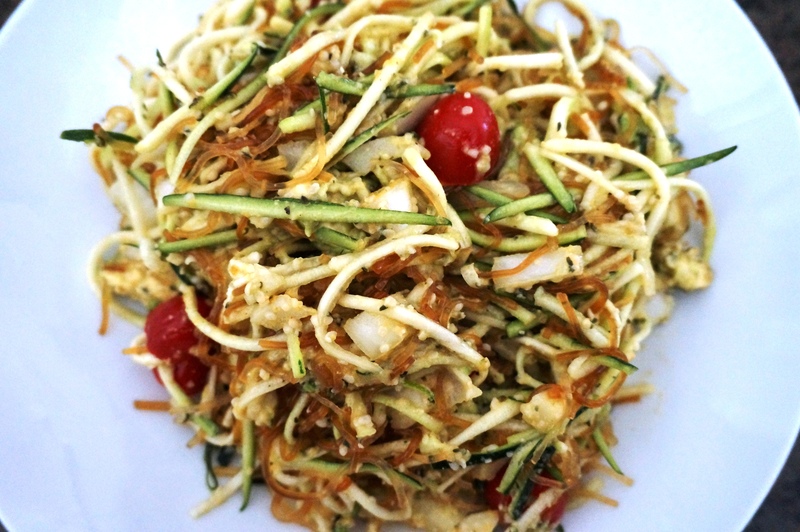 On the plus side, a cup of kelp noodles provides about 15% of your daily calcium and iron, and about 50% of your daily vitamin K. Because they are low in fiber, however, you will want to be sure to pair your noodles with plenty of fibrous vegetables, nuts and seeds. Onto my lovely summer dinner! 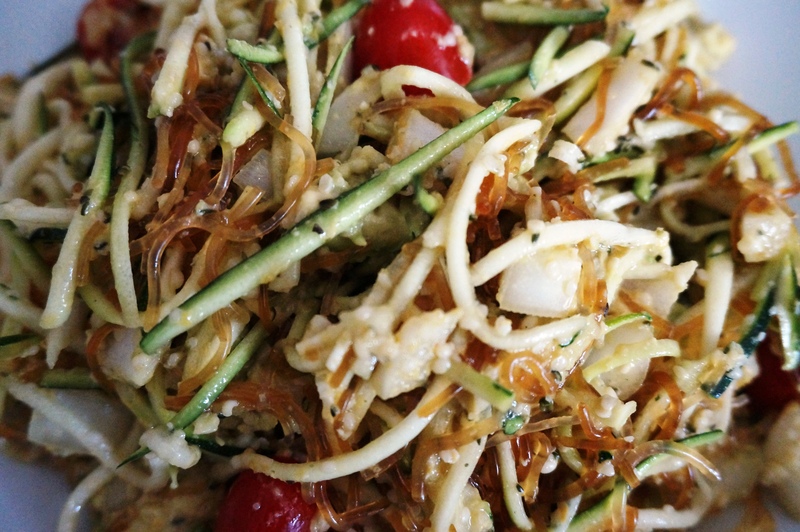 First off, since kelp noodles tend to have a somewhat disagreeable crunchy/rubbery texture, it is important to soften and enhance the noodle by marinating it ahead of time. I plopped the mass of noodles into a strainer and rinsed them well with water. I then took the scissors to the noodles, jabbing at them to slice into smaller pieces. Transferring the noodles to a container, I doused them in tamari sauce, gave them a good toss to make sure they were all well-coated, and then put the lid on and place the container in the fridge. Toss all with tongs, squishing the avocado into a creamy sauce-like consistency. I would suggest adding some fresh basil, if you have some – a final I am The Queen Bee move!